The laundry room. It’s where the never-ending task of doing laundry happens. When you have a small laundry room, it’s hard to keep it organized and it may feel like there is no storage for detergent, stain removers, etc. Our laundry “room” is really a closet. It wasn’t built large enough to have doors placed on it, so all the mess is visible to everyone who visits. All the laundry soap and other laundry items get stacked on top of the dryer, which is quite the eyesore. Here are some small laundry room organization ideas and storage solutions. If you are like me, it’s nice to see what others have done to transform their spaces to give you some motivation and inspiration. 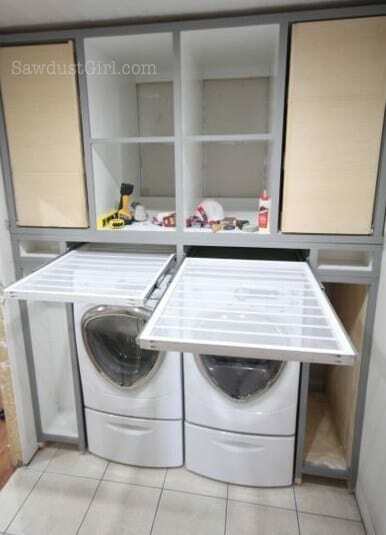 This laundry room seems relatively easy to put together. There are laundry baskets on the upper, tilted shelf for you to either separate out dirty laundry or to put clean, folded clothes into that are waiting to be put away. Plus, she added a small shelf under these laundry baskets to hold detergents. 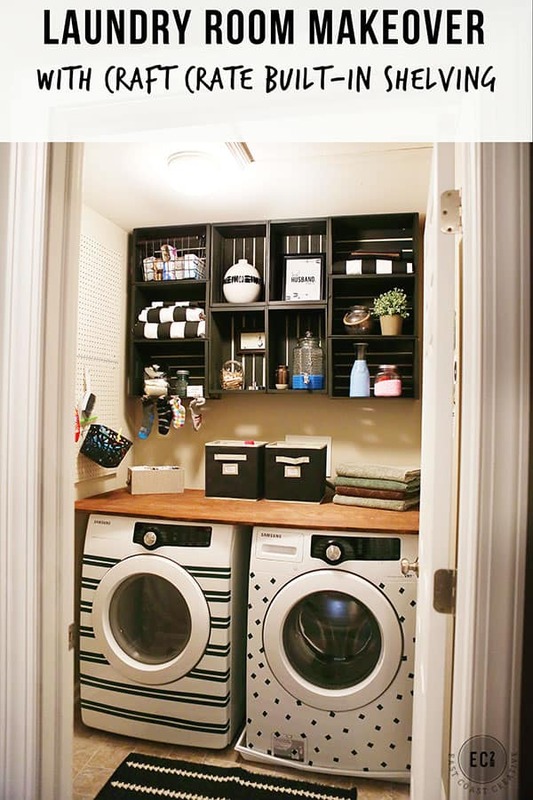 You can see how she did this upgrade to her laundry room closet at Hold On To Your Hats Blog. The shelving they added to this small laundry room at Angie’s Roost is so great! They made it so socks couldn’t go disappearing behind the machine, plus added a ton of storage on the new shelves! Check out the details at Angie’s Roost. Here is another closet laundry room. These awesome shelves/cabinet was added above the washer and dryer to add a lot of room. Plus, there is the rod to hang clothes on. 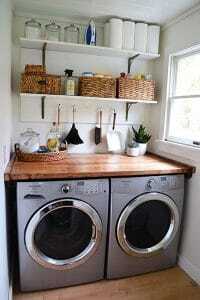 This adds a lot of functionality to this small laundry space. You can find the details of this transformation at Kirsten Erickson. You can add in a rolling laundry caddy between the washer and dryer to store a lot of the detergents, bleach, stain remover and other bottles. These DIY wooden, floating shelves add a lot of rustic flair to a small laundry space as well as storage. You can see how it was made at Thrifty Decor Chick.. This laundry room is larger than what is in this picture. 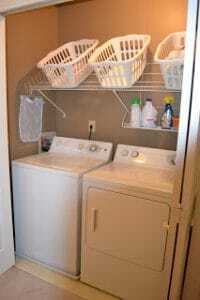 But many small laundry rooms are the same size as what you see above or smaller. 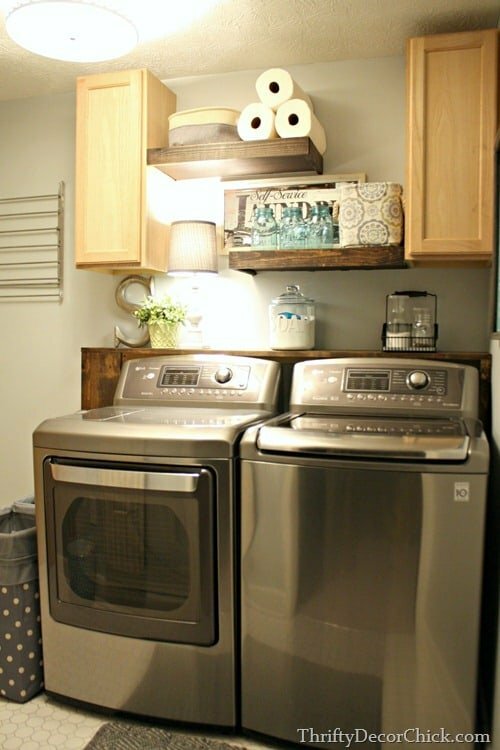 The way this little section is set up is great for a small laundry room organization idea. You can see how she set this up at Simple Home Blessings. 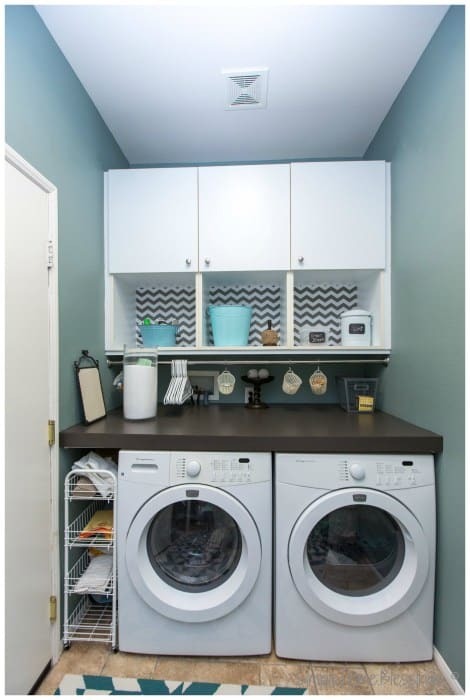 How fun is this laundry room? Over at East Coast Creative, they did a laundry room makeover and the results look great! They added shelves by hanging crates on the wall. There is also a spot for lost socks. I love the decals on the washer and dryer too! So much fun! These pull-out sweater drying racks are a great idea to add above your washer and dryer. They don’t take much space at all but come in really handy when needed. You can find the plans to build these at Saw Dust Girl. If you liked these ideas, make sure to PIN this post!